The LADY is a three-roomed apartment (57 sqm), located on the first floor of the Tower. 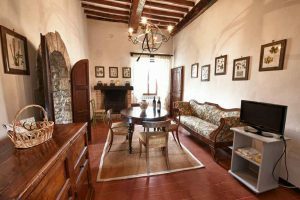 It features two double bedrooms with AC, one bathroom, a living room with fireplace and full kitchen with a table inside. 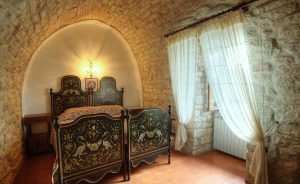 One bedroom may features a king size bed or 2 twin beds; it is in the part of the tower where they used to open the drawbridge and has stone walls and barrel vault ceilings; the other bedroom features 2 twin beds and has wood beams. Living room, kitchen and bathroom have wood beams also. The bathroom – that is accessed through a stair – has a window and is equipped with all the sanitary ware, including a beautiful brand new large shower with rain shower head. Furnished with 19th century antiques and elegant fabrics, The Lady features independent heating system, flat TV, telephone, WIFI, dish-washer, hair-drier and safe box; it has plenty of fluffy towels including swim towels, fine bed and household linen, cutlery, crockery and kitchenware, and parking space in the car port. 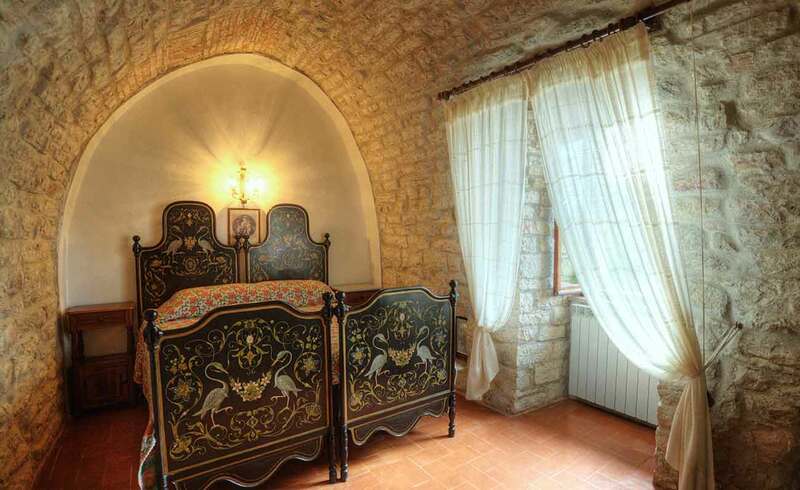 It is full of light and enjoys sweeping views of the Tiber valley.